GenreOnline.net: SANCTUARY: QUITE A CONUNDRUM trailer and website from Midnight Releasing! SANCTUARY: QUITE A CONUNDRUM trailer and website from Midnight Releasing! Los Angeles, CA – SANCTUARY: QUITE A CONUNDRUM, the indie film that took the festival circuit by storm, garnering both critical and audience acclaim, comes home when Midnight Releasing, the leading purveyor in home entertainment horror, releases the thriller August 26th on DVD, VOD and digital download. With a fresh, hot young cast and a story that defies description (we’ll try, though), the winner of numerous festival honors will be available throughout North America via multiple platforms. DVD availability is set to include Walmart and most other retail and rental chains. On the digital side, the film will be available on all major and minor cable VOD channels as well as major internet platforms including iTunes, Amazon Instant, Vudu, Google Play, Xbox Video, Sony Entertainment Network, and others. SRP for the DVD is $14.98, with DVD pre-book on July 15th. The directorial debut of Thomas L. Phillips, who also wrote, edited and produced the film, SANCTUARY: QUITE A CONUNDRUM paints an unforgettable and truly bizarre picture of suburbia – with a brush dipped in blood! BFFs Mimi (Sasha Ramos) and Tabitha (Erin Nicole Cline) are holding a party at Mimi’s house while her father is away on business. Inviting boyfriends Dutch (Joe Coffey) and Sean (Chris Greene), Mimi even allows her younger sister Kylene (Emily Rogers) to invite her boyfriend Harris (Anthony Rutowicz). 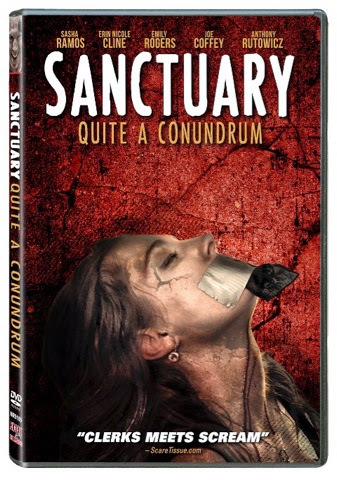 Selected for presentation at over 30 film festivals all over the world, SANCTUARY: QUITE A CONUNDRUM is well on its journey in becoming the next great cult classic. Awards include Winner Best Comedy at the 2012 Chicago Horror Film Festival, Winner Best Feature Film at the 2012 New York International Film Festival, Winner Best Horror/Thriller Feature Film at the 2012 Bare Bones Film Festival and Winner Best Feature Film at the 2013 World Independent Film Expo. "The movie is ready for the world to see, and I am ready for the world to see it,” observed Phillips. “Let the reactions and word of mouth begin, ‘cause I know for a fact, that the word of mouth for a movie such as this, will take it to a whole other level."